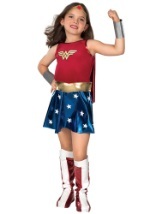 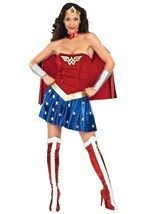 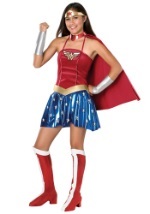 Patrol the skies in your invisible jet and maintain order as Wonder Woman with this costume. 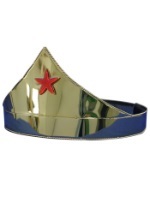 The outfit includes a leotard with a red top and blue and white star-studded bottom. 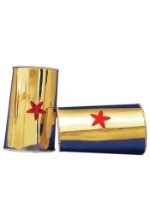 A gold vinyl “W” chest plate add authentic detail. 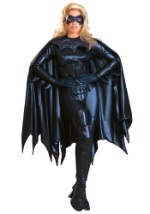 (Note: Does not have ties at hips as shown.) 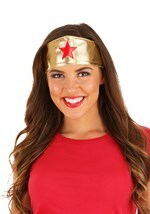 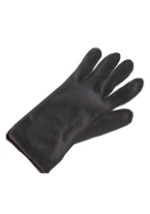 In addition, the costume is comprised of many accessories. 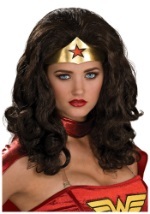 A red satin cape fastens in the front of the neck. 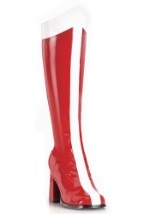 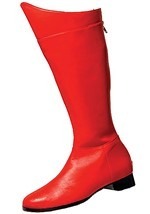 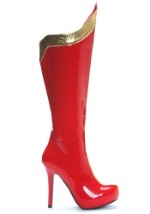 Red and white vinyl knee-high boots, shining gold vinyl headband and belt are also included. 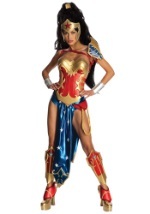 The Wonder Woman costume is perfected by silver vinyl bracelets and the signature Lasso of Truth. 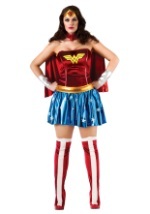 Show that only women are truly strong enough to be superheroes this Halloween.